alaTest har samlat in och analyserat 78 tester för Ricoh THETA. Det genomsnittliga betyget av denna produkt är 3.8/5, att jämföra med genomsnittsbetyget 4.1/5 för produkter i kategorin Videokameror. Recensenterna gillar storleken och konstruktionen. Bländningen uppskattas inte lika mycket. Vi har analyserat betyg från experter och användare, produktens ålder och andra faktorer. Jämfört med andra produkter i kategorin Videokameror belönas Ricoh THETA med en alaScore™ på 87/100 = Mycket bra kvalitet. Hands-on: The world's first 360 degree camera, but is it worth the bother? If you really only want to shoot 360 images, the Theta does a fantastic job of capturing the entire scene. At more than £300 we are not sure the Theta offers great value for money. The Ricoh Theta is compact camera that captures unique 360° spherical images, but it's on the pricey side and battery life is disappointing. Captures unique 360-degree images. Wi-Fi is supported. Android and iOS compatibility. Very compact. Pricey. Very limited battery life. Image quality isn't the greatest. With a single (fast) shot, this camera takes full spherical images and, with some help from an app, lets you zoom, swipe, and rotate them. This incredible device allows users to capture the area all around them - not forgetting above and below - all in a single spherical image. But that's not all; this new spherical camera can also capture spherical videos! 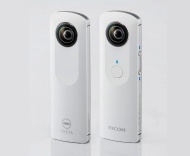 From the 14 November 2014, an API and SDK (beta version) will be released on theta360.com site to allow users to develop their own apps and add new exciting capabilities to their Ricoh Theta. The Ricoh Theta allows you to take 360° spherical images, either by itself or there are apps available so you can use it with Android and iOS devices. It is available to purchase for £329.99. This innovative, little camera lets you easily capture spherical images.